ABI Research’s digital security research offers end-to-end coverage of the digital security ecosystem – from information and communication technologies to operational control process. This research is particularly salient to enterprises facing the growing proliferation of cyber threats, while also becoming increasingly connected, as in the convergence of IT and OT. 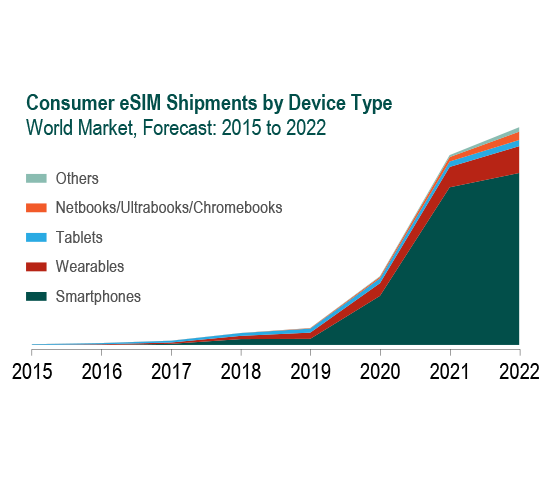 The consumer eSIM market remains in a nascent phase, but one which is rapidly evolving in terms of device support and component development. 2017 proved an extremely important year for the consumer eSIM market, thanks to the launch of the Google Pixel 2, alongside the Apple LTE Watch series 3. Despite this, the market is still awaiting its tipping point and in the interim, those active in the development of the required eSIM hardware have been innovating through technology convergence in a bid to differentiate prior to tipping point realization. The eSIM form-factor is one which is transformative in nature, which will undoubtedly impact the entire SIM value chain in some way, shape, or form, impacting business models, sales channels, processes across smart card, secure IC, MNO, and OEM vendor types. Gait over Here! Will China’s Machine Vision and AI Startups Help Gait Biometric Recognition Back on Its Feet? Is Apple’s eSIM Support the Beginning of the End for the Traditional Removeable SIM Card? Does Artificial Intelligence Pose a Risk to National Security? FPC Brings China’s First Biometric Contactless Payment Card: What Does the Future Hold? What is The True Cost of Rectifying a Security Flaw/Breach? Is Untethering the Key to Unlocking Apple Watch Success? How Does Your Managed IoT Security Services Strategy Stack Up? eSIM – Why Are We Still Talking About Handsets! FBI vs. Apple: What are the Implications? Could Fully Homomorphic Encryption Revolutionize Security? Why Vulnerability Management is Essential? Who Were the Winners of the 2015 Biometrics London Conference? Is the e-SIM Really a Threat to the Traditional SIM Card Market? Google's Android Pay Debuts in the U.S.
Can Mobile Really Impact the Passport Market? Biometric Voter Registration– What is to be Learned from the Mistakes? How Deep is Your Security? Boost for law enforcement face biometrics - but at what cost? Could Mobile Payments Unlock Contactless Card Issuance in the United States? TEE and SEs: Competing or Complementary? Could Apple SIM Have a Play in the Hyper-Connected World? As an emergent technology, few have been as disruptive as blockchain in stirring up furor with regards to its transformative potential. With some hailing it as the next digital miracle, and others disdaining it as vaporware hype, the spectacular volatility of Bitcoin has only served to stoke the fires of debate. There is groundbreaking value in the emerging blockchain phenomena beyond cryptocurrencies, notably around manufacturing and supply chain logistics. Can blockchains be leveraged to reduce friction for faster and more efficient logistics in industrial manufacturing and supply? This webinar will seek to explore the applicability of blockchain to further the Industry 4.0 movement. How can blockchain be used in industrial applications? What is the potential of smart contracts for manufacturing? How can ledger technology deliver logistics 4.0? Is blockchain a viable technology for Industry 4.0? Following the webinar, ABI Research Enabling Platforms Vice President, Dan Shey, will give attendees an introduction of our new Blockchain & Distributed Ledger Technologies (DLT) research service.